Since I now had a few free hours and I was so close to the mall I decided to go shopping. This is very rare for me. Typically I dislike the mall and I am not really a fan of clothes shopping but I had a specific goal. I have two ancient t-shirts, one orange and one red that really needed to be replaced. Of course I have a ton of other shirts but I needed a solid red and a solid orange. I have read a bit about capsule wardrobes and decision fatigue but honestly I am just not interested in wearing a “uniform” (21 years in the military will cure you of that) or only having seven or thirty-three or whatever number pieces of clothing. I seldom have a problem deciding what to wear and I wear everything in my closet at some point in a given 365 day period. That being said now that I am in my fifties (gasp!) I think my casual bordering on slob look could use some updating. I have many older items that I wear but that honestly I don’t love. I have done a pretty good job over the last couple of years of purging items that didn’t fit or were badly worn but there was still some purging room in the ‘but does it make me feel good’ area. And here is where the “Good Witch” comes into it. Catherine Bell plays Cassie Nightingale. I have been watching season three currently on the Hallmark Channel and catching up on seasons one and two on Netflix. Catherine Bell is only 2 years younger than me so she is the right age to look to for fashion ideas. And I love how serene and unflappable “Cassie” always is. And then I realized how much I like how Cassie dresses (aside from those high heels!). She often wears casual shirts with jeans or skinny pants. Shirts that look comfortable, not too tight and a step up from a plain t-shirt. So I had my shopping inspiration! I arrived home with four new summer tops, one winter shirt (from a clearance rack) and a lightweight cardigan. Once home I went through my summer t-shirts and pulled nine that I didn’t love. For now they are in a bag in my closet and if at the end of the summer I haven’t missed them, out the door they go! 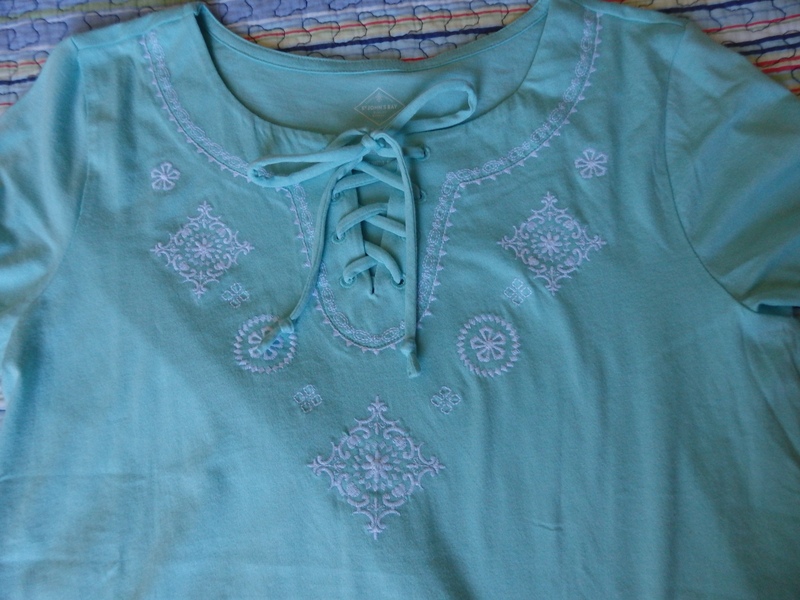 I love the embroidery details and it is a different color for me. 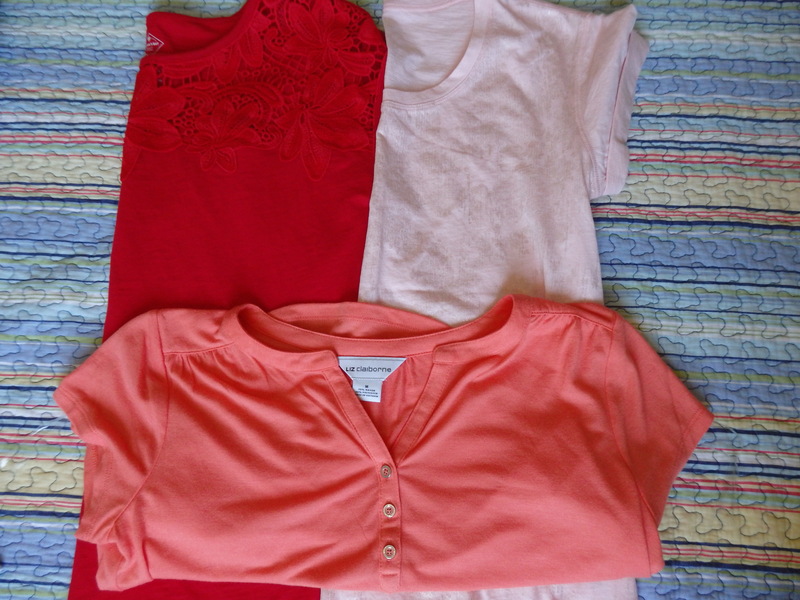 My new red t-shirt with lace trim, a pale pink accented with silver (hard to see) and my new orange shirt. Not quite the shade I wanted but I love the buttons and neckline. 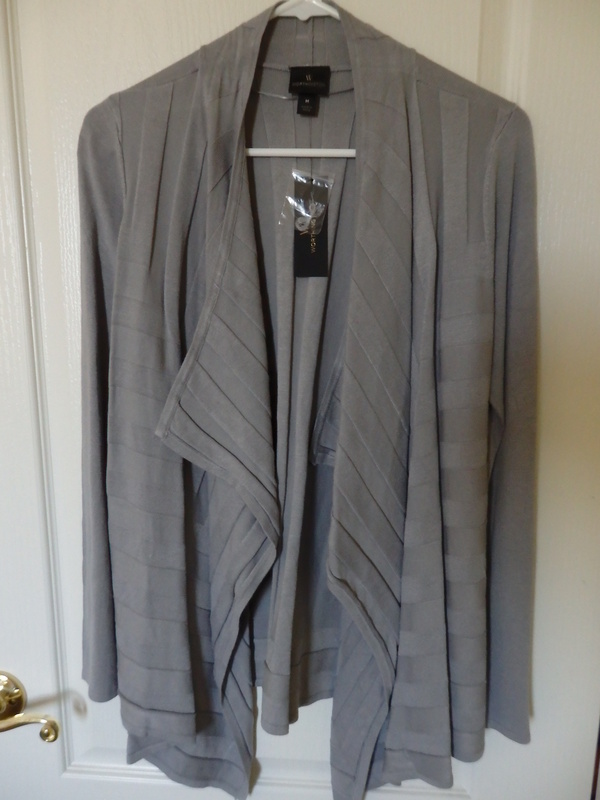 A light to medium weight simple cardigan. This will probably work as a coat for three or four months out of the year here! 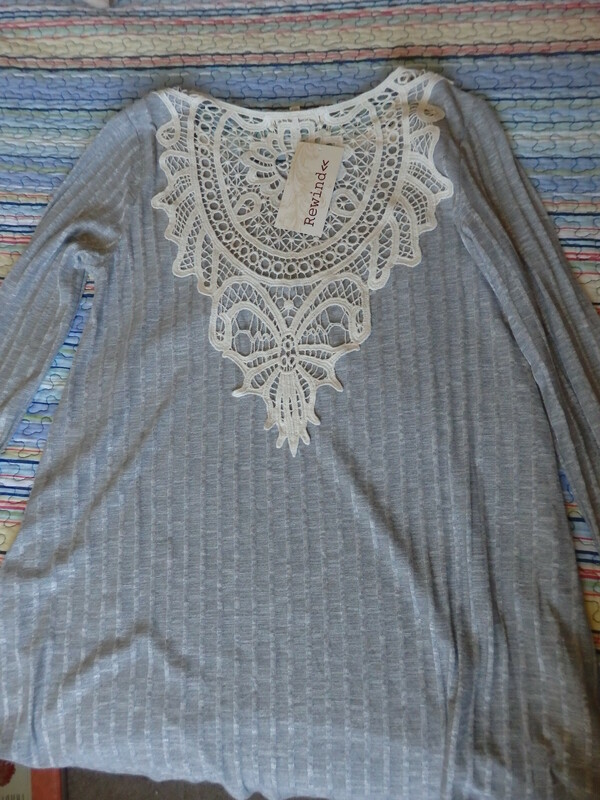 The lace detail on the back of a new shirt for winter. Not too heavy and a lovely silvery gray. I am trying to find that tiny area between looking ridiculous (mutton dressed like a lamb!) and looking dowdy not for other people but so I feel good about myself. The only way I can describe it is that my body seems “lumpy” these days. This aging thing is not for sissies! And I am glad you like my choices! 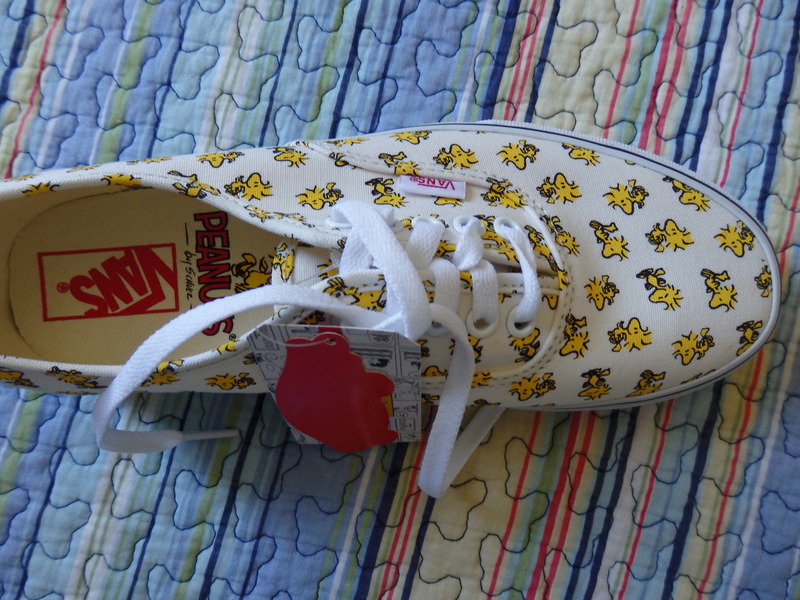 I’ll have to report back on how I feel wearing them. You are neither mutton nor lamb so may dress as you please. Oh, I know what you mean about lumpy body; mine is one big misshapen louty lump! And I like to echo your observation about aging is not for sissies: it makes me feel badass for my aches and pains!